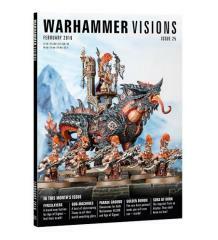 #25 "Fyreslayers, God-Machines, Parade Ground"
Like that rarest and most precious of metals, ur-gold, Warhammer Visions 25 arrives to stoke the passions of painters, collectors and modelers everywhere. This month, the sons of Grimnir make their fiery entrance into the Age of Sigmar – and what an entrance it is. We bring them to life with some scorchingly good photography. We look at the Carnival of Slaanesh, the God-Machines of the Titan Legions in a Forge World special, and a beautiful Dark Eldar warband in Army of the Month. All that, plus we’ve still got all your favorites from Golden Demon to Paint Splatter, Parade Ground, Blanchitsu and more to boot.